NAUGATUCK — A Waterbury man is facing a list of charges after police say he barged into a home on Carroll Street and stabbed a man and a pregnant woman Friday night. The bloody incident played out at about 9:40 p.m. as officers rushed to Carroll Street after receiving multiple 911 calls about a stabbing. When they arrived on the scene, officers found a 43-year-old man bleeding heavily from a stab wound to his head in the stairwell at 17 Carroll St., according to the incident report. Officers quickly learned the assault occurred at 38 Carroll St. and another victim, a 36-year-old pregnant woman, was also assaulted and fled the home. Officers found the woman lying behind the home at 40 Carroll St. a short time later. She suffered multiple stab wounds to the left side of her body and abdomen, and was bleeding heavily, police said. Both victims suffered serious injuries and were taken to local hospitals, police said. The woman was listed in stable condition Tuesday afternoon, according to St. Mary’s Hospital spokeswoman Stephanie Valickis. The status and condition of the man is unclear. As officers searched for the woman, they located Rafael Hernandez, 63, walking from out behind 38 Carroll St. Hernandez’s hand was bleeding profusely, the incident report states, and he matched a description of the suspect provided by the male victim. Hernandez’s injuries were consistent with his hand sliding down on a knife while using it, the report states. He was taken Waterbury Hospital for treatment while in policy custody, the report states. As officers searched the home, they came across a bloody scene. A blood trail from the street and down the driveway, led through the dining room and kitchen into a living room, where signs of a struggle were evident. There was a large amount of blood on the floor next to the couch and blood splatters on the curtains, according to the incident report. Police located two children, ages 16 and 9, hiding in the house. They were home when the assault occurred, police said, and unharmed. Police contacted the Department of Children and Families to care for children. Police classified the case as a domestic violence incident and didn’t disclose the names of the victims. Police said Hernandez and the woman had a previous relationship, and the children hiding in the home are their children. Police believe the two victims are in a relationship, the incident report states. The children told police Hernandez called them on Friday and told them that he was in Puerto Rico, the incident report states. Police say Hernandez doesn’t live at the home and came to the house with the intent to confront the victims. 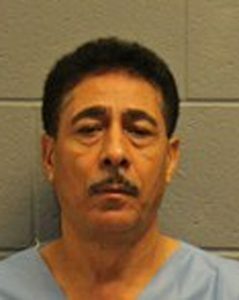 The male victim told police he was at the home with the woman when Hernandez came in and “immediately attacked them with a butcher-type knife,” the incident report states. A knife covered in blood that police believe was used in the stabbing was found on top of a cabinet inside the garage, the incident report states. Police also located a rental car, with the engine still warm, parked crooked up the street, the report states. Inside the car, police found an open brand new package for a large knife on the front seat, the report states. Police also found the keys to the car and a prescription container in the car, and secured it as a potential crime scene. Police believe Hernandez also smashed the windshield and rear window of a pickup truck belonging to the male victim parked in the driveway of the home, the report states. The investigation is ongoing. Lt. Bryan Cammarata said there are still a lot of unanswered questions as to exactly what occurred and why, and officers have been actively investigating since Friday. Police charged Hernandez, of 304 Moran St. Apt. 1, Waterbury, with first-degree assault, first-degree assault on a pregnant female, home invasion, two counts of first-degree reckless endangerment, two counts of risk of injury to a minor, and criminal mischief. Hernandez was held on a $3 million bond following his arraignment at Waterbury Superior Court on Monday. He is scheduled to appear in court again on Sept. 26, and the judge ordered that Hernandez has to turn over his passport if he posts bond. Editor’s note: This story has been updated from the original post.